I promised that I would take some photos of Morganna’s quilt after she came home for Spring Break, so here they are. 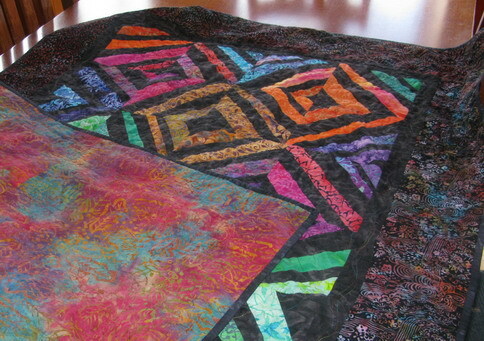 This one shows the overall effect, including the backing fabric, which is another batik that has nearly all of the colors of the quilt included in it, except for the black, indigo, clear blue and clear purples. But it looks great with the other fabrics, as you can see. The thread we chose is multi-colored so in some parts of the quilt, it shows up readily, while in others, it fades into the background, so the quilting is either obvious or subtle, depending on what part of the quilt you are looking at. From the back, it is very subtle. 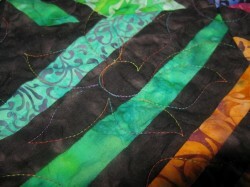 Here are close-ups so you can see the funky continual line quilting that Susan and I came up with for her to do. Lots of swirlies and spirals and waves with leaves and flowers worked into the design. These designs thematically echo the flowery, swirly, spirally designs of the various batiks on the quilt top. As much as I love Susan’s quilting, I want to do more of my own quilting work, because when I free motion on smaller projects, I can do some really pretty stuff. But on large quilts, I am not there yet. My dear friend Amy, who is living between two homes, one here in Athens and one in Stow, Ohio. Once she finishes her PhD in Geography at Kent State, she will be moving back here, but until then, her quilting frame is going to have to be put into storage. Well, she had me come to her place and give it a go–and she is not kidding–quilting on it is just like drawing. Even without a stitch regulator to keep the stitch length perfectly even, the thing is the next best thing to a long-arm machine. I think that after a couple of evenings’ practice, I should be able to quilt beautiful free-motion continual line-designs. And bless her, she offered to let me baby sit it for her while she moves–rather than put it all into storage. So, needless to say, I am cleaning out a place to put it–it is a large bit of equipment–so I can maybe quilt the baby quilt I am making for a new cousin–Claire Marie–all on my own! That is so beautiful— words fail me! One of the comforts in life is wrapping yourself in a quilt made with love. Terrific job. The quilt is lovely. I reallylike the batiks. What is the size of the squares? It looks like it was really fun to do . 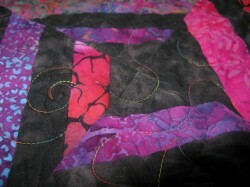 Next time do the quilting yourself, although they did a lovely job. 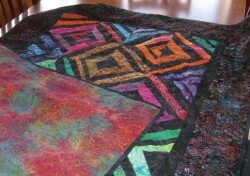 There is something gratifying about seeing a quilt done yourself start to finish.